This print may represent a scene from a lost Soga play. While this image may stand alone there is a reference to a triptych - which we have been unable to locate - in which this event is the central panel, as noted in the Museum of Fine Arts Bulletin from 1962. It notes that Fujikawa Mizuemon is confronted by a striking snake. Elsewhere, whenever Mizuemon is mentioned he is referred to as a villain. 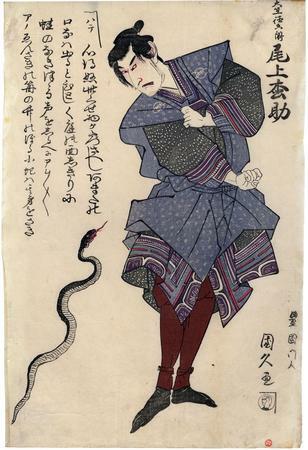 There is a print by Toyokuni I of a different actor, but in the same role and in almost exactly the same pose for both the actor and even the snake. Another difference is the costume, but other than that both Kunihisa and Toyokuni I, his teacher, used almost exactly the same layout. Another difference is that the Toyokuni I has a plain background with no text. This figure appeared in the play Hana-ayame Bunroku Soga (Blooming Iris, Soga of the Bunroku Era) which was performed at the Miyako Theater in the fifth month of 1794. Another artist who portrayed this same character based on the same performance, but in the form of a large head and upper torso, was Sharaku. His print may represent the same scene as the one seen here - sans the snake - if you look carefully at the dramatic placement of his arms with his hands hidden by his sleeves. Three artists creating two variations in their presentations. There is an unidentified collector's seal bottom right.